Twickenham was the home of a number of the rich and famous throughout the centuries, for example at Richmond House. It is hardly surprising that neighbours would take an interest in one another as seems to be the case with Alexander Pope, who lived in Strawberry Hill, and Henrietta Howard, Countess of Suffolk, who built nearby Marble Hill House. “I intended to wait on Mrs Howard to day ... I was impatient to know the issue of affaire, and what she intended for this autumn for no time is to be Lost either if she intends to build out houses or prepare for planting. I will ... call upon you as soon as I am able that we may goe together to Mrs Howards”. (Sherburn vol ii pp.196-7, 1723 Lord Peterborough to Pope). A letter from Pope in 1724 indicated that he was neglecting his own writing to spend more time on Marble Hill. Whilst staying at Sherborne Pope, wrote “I have spent many hours here in studying for hers [Mrs Howard’s garden] and drawing new plans for her”. Thus, it has been suggested that the gardens at Sherborne may have influenced the gardens at Marble Hill. (Sherburn vol ii pp.236-40, 22 June 1724 Pope to Lady Blout of Twickenham Grange - see Prado's Grapes). Records seem to show that there was some involvement by Pope in the gardens; an account for work in the grounds in January 1725 records payments for a Garden Roll ... by the order of Mr Pope” and for “120 ft. of Deale Railling Corss ye Bolling Green”. (Peter Willis, The Work of Charles Bridgeman in the Amateur Historian vol vi no. 3, Spring 1964 pp.91-6). Professional advice for the gardens was sought from Charles Bridgeman by Mrs Howard. 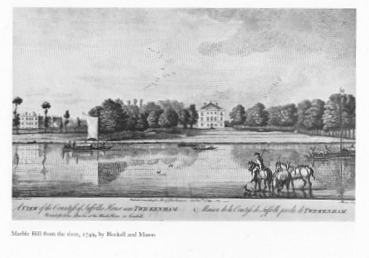 On 28 September 1724 Bridgeman wrote to Pope explaining that he had been very busy since a visit to Marble Hill with Pope but that he had “begun on the plann, and have not [lef]t from that time to this so long as I could see, nor shall [I] leave it till ‘tis finish’d which I hope will be about tomorrow Noon”. (Sherburn vol ii p.261 28 Sept 1724 Charles Bridgeman to Pope). Local Area, Prado's Grapes, Gifford Lodge, Pope's Legacy, Walpole's Strawberry Hill House, Grand Neighbours - Richmond House.